I’m finally brewing again. 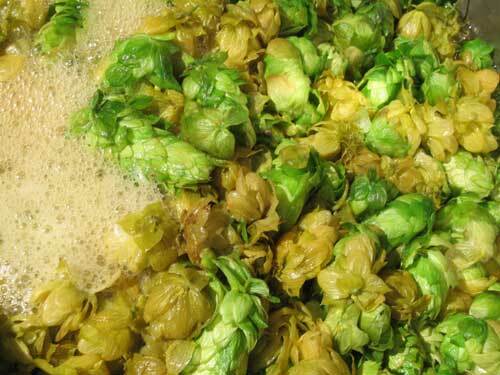 I’ve invited a friend who has wanted to give brewing a try, so we’ll be brewing a batch of IPA on Sunday. It’s a relatively simple IPA recipe, and I should probably save the name for a more significant beer, but its timely, and I’ll be happy to throw some serious ounce-age in for aroma. This recipe is for a 6 gallon batch. The rest of the stuff is pretty standard (for me). Safale dry American ale yeast (with a starter), irish moss, bring to boil, etc. Anyway, running two simultaneous all-grain batches wasn’t as bad as I thought it would be. The beers were all racked nicely, and all finished in the 1.050 – 1.060 range with few problems. 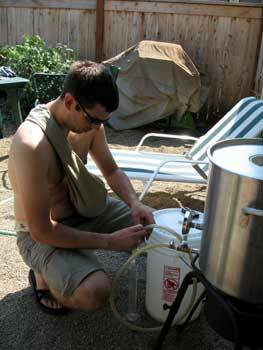 There was something satisfying about brewing 15 gallons of beer, too. The pale and ESB were both pitched with an ale yeast from Joe’s place of work, and the Pils with a lager yeast. We already have krausen too. Brewing all grain with Joe was slightly different than brewing with Scott. Scott knows his equipment, knows the process, and has his thermometer calibrated. Joe and I were a little more trial and error. However, this was our first unguided experience, so we both agreed that it would be largely a learning experience and we’d worry about some of the other details later. All throughout the process, Joe would point out things like “there are two schools of thought on this” and we’d quickly debate or simply default on a position before moving on to the next step. Style is largely formed on limitations. 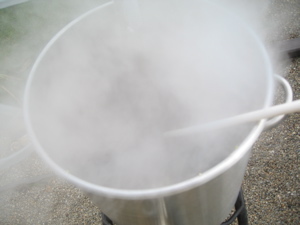 If mashing two separate batches, either mash them side-by-side, or bring two thermometers. 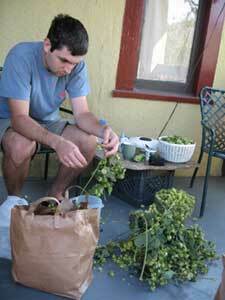 Brewing on a lovely day is no better and no worse than doing anything else on a lovely day. 10 gallons of wort is, like, twice as heavy as five gallons. Lift with the knees. Scott brought over his new brew kettle and mash tun yesterday and we set up an ad-hoc 3-tier brewing system in my kitchen. We brewed a 10 gallon(ish) all-grain batch of Scottish 70 shilling. New equipment and new techniques slow things down a little, and this was not different. We did manage to brew the beer in just under 7 hours, though. Scott modified a recipe we found on TasteyBrew for 10 gallons and for the hops we had on hand (I hate Northern Brewer… for no good reason) and I fired up a starter using Safale S-04. The sparge wen alright, though the wort gravity on the sparge was a little lower than expected. We deliberated and decided to stop a bit short of 10 gallons. The boil went fairly well though there was a surprising amount of hot break, and the steam coming off the wort made it difficult to see the wort. 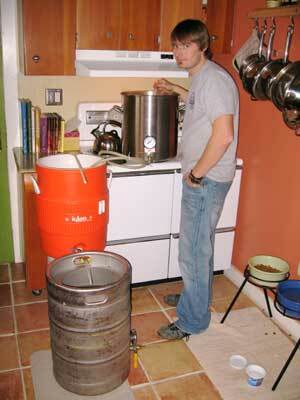 Ultimately, we racked off around 8.5-9 gallons of beer with on O.G. of 1.036. While waiting for the boil we stood out in the cold, drank some brew, and discussed what techniques have improved our results the most and what challenges we want to take on next. Anyway, here’s the recipe. We joked about how much of the process is now second nature that we fail to include any instructions with our recipes. If you’re curious about the process, um… see a book or something. So I gave up on the name before actually formulating the recipe, so this isn’t a milk stout as originally intended. Anyway, brewed this on Saturday and it’s now fermenting contently in the kitchen. When I picked up the ingredients from Steinbarts, I had Ella with me and was having trouble milling the grain. One of the gentleman behind the counter was happy to assist. Anyway, at brewing time yesterday it was clear, cold and windy. I brewed with just over 6.5 gallons of water, thinking most would evaporate. With 20 minutes left, not much had evaporated so I turned up the gas to get a turbulent boil. Seems to have done the trick as I racked just a tad over 5 gallons. 1.2 oz Galena @ 5 min. I’ve been enjoying some hoppy/spicy stouts this fall, so I was hoping the Galena could impart those characteristics. The wort tasted great, and the O.G. was on target at 1.054. I figure I got the beer started early enough that I’ll actually get it kegged before classes start again. If not, Joe can make as much fun of me as he wants. The last two did turn out though. 2 oz Vanguard @ 10 min. Michelle cubed and baked all the squash and prepped spices, and since she enjoys the spice addition, we may add more to secondary if the flavors mellow when racking. So far it tastes great. I tried the steeped and boiled squash and both were bland and stringy – a good sign that the fermentable sugar and flavor had been extracted. Here’s a slight variation on Ipanema that I’m brewing for Michelle’s postnatal enjoyment. She gave up beer and coffee without too much fuss or complaint when she found out she was pregnant, and I even gave it up for a while. Soon she’ll be able to have a little herself, so I’d better get this one brewed. 1.50 oz Palisades @ 10 min. 1.0 oz Palisades @ 5 min. 1.0 oz Palisades @ 2 min. This one will have to be fermented in the basement since it cools down to 80F in the house overnight.